Whether you are in a band, part of a stage performance or just want to add color washes with RGB infinite color mixing possibilities to any lighting installation, the LED PAR 64/168-10 is the perfect solution to brilliantly light up any stage. This projector is equipped with 168, 10mm LEDs for an ultra bright punch and features DMX-512. The LED PAR 64/168-10 LED par can is also performer friendly because it emits almost no heat onto the stage. 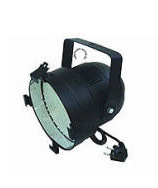 Just add the LED PAR 64/168-10 punch and you have got the optimal stage light show! • Weight: 6 lbs. /2.5 kgs. Whether you are in a band, part of a stage performance or just want to add color washes with RGB infinite color mixing possibilities to any lighting installation, the LED PAR 64/330-5 is the perfect solution to brilliantly light up any stage. This projector is equipped with 330, 5mm LEDs for an ultra bright punch and features DMX-512. The LED PAR 64/330-5 LED par can is also performer friendly because it emits almost no heat onto the stage. Just add the LED PAR 64/330-5 punch and you have got the optimal stage light show! Whether you are in a band, part of a stage performance or just want to add color washes with RGB infinite color mixing possibilities to any lighting installation, the LED PAR 64/183-10 is the perfect solution to brilliantly light up any stage. This projector is equipped with 183, 10mm LEDs for an ultra bright punch and features DMX-512. The LED PAR 64/183-10 LED par can is also performer friendly because it emits almost no heat onto the stage. Just add the LED PAR 64/183-10 punch and you have got the optimal stage light show! to any lighting installation, the LED PAR 64/36-1 is the perfect solution to brilliantly light up any stage. This projector is equipped with 36, 1w LEDs for an ultra bright punch and features DMX-512. The LED PAR 64/36-1 LED par can is also performer friendly because it emits almost no heat onto the stage. Just add the LED PAR 64/36-1 punch and you have got the optimal stage light show! • Weight: 10 lbs. / 4.5 kgs.